Many important discoveries resulting in new major plate varieties for the catalogue. Nearly 300 pages and over 380 illustrations (some in colour) to help the collector with these varieties. Details of the sheets printed by each plate and the identity of those used for the overseas Overprints. Ever since they were first issued some 90 years ago, the King George V Seahorses have been admired by stamp collectors. Yet many of their technical and philatelic aspects have remained puzzling. Much written about them is incomplete or contradictory; little was known of their printing plates or their many varieties. Over time, this has encouraged a number of myths to grow unchallenged. A product of six years' research, Discovering Seahorses is the first comprehensive study of this issue. Based on contemporary documents and proof sheets held in our national museums and archives, together with material from private collections and dealers' stocks, the book relates the story behind the creation of the Seahorses, and the many changes they experienced during their production over a period of 26 years. For the first time, all their plates and the quantities printed are identified. It places the numerous shades in context and illustrates many new and significant plate varieties that are expected to be included in the next Specialised Catalogue. Its detailed scope covers the Great Britain issues and all the overseas Overprints, and includes check-lists of the shades and the paper, watermark and printing varieties. 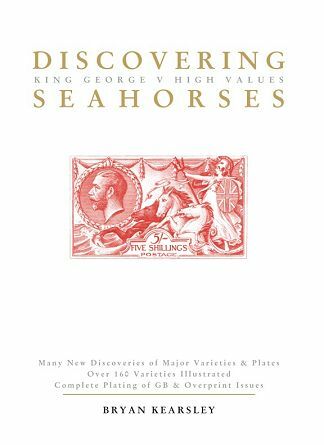 This is the complete guide to all the Seahorse issues and will enable collectors to enhance their collections with discoveries and information previously unknown. Now out of print. ISBN 0-907630-20-0. Size 8½ x 11 in., hardback, vi + 278 pp. + 8 colour plates. Published 2005.